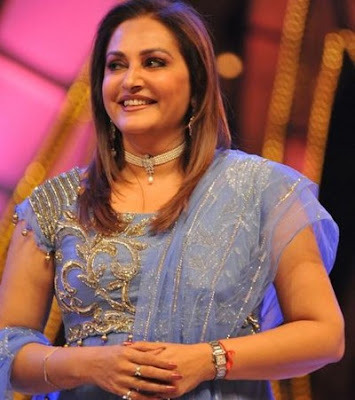 Jayaprada was born as Lalita Rani in a middle class household to Krishna and Neelavani in Rajahmundry, Andhra Pradesh on April 3, 1962. She was a small town girl with dreams of becoming a doctor. Her mother enrolled her in dance and music classes when she was seven years old, in addition to going to a regular school. Even though, her father and uncle were film financiers, her initial break into films didn't come through them. She was discovered dancing on stage at a school function when she was just fourteen years old. 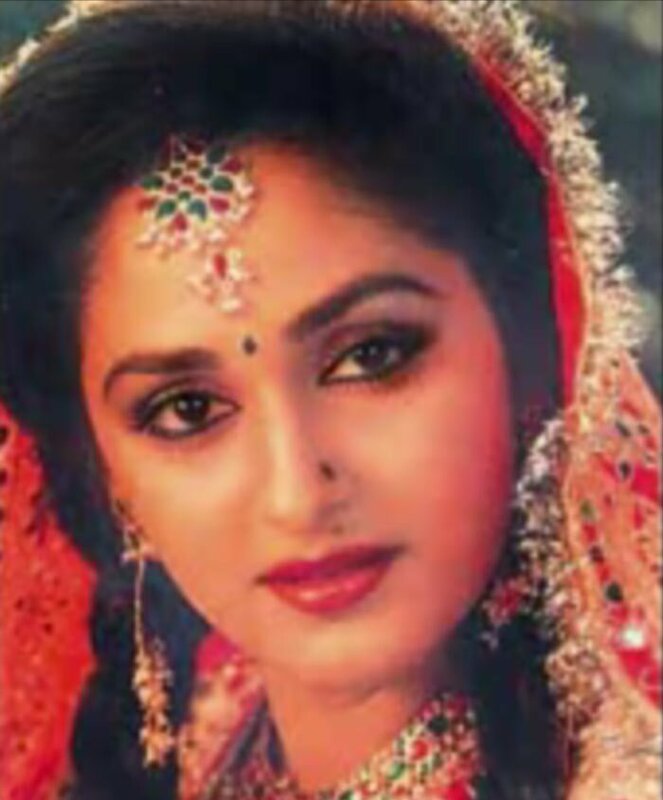 Character actor Prabhakar Reddy gave her the name of Jayaprada and introduced her in a three minute song in the Telugu film, "Bhoomi Kosam" (1976). That immediately led her to longer roles in "Devude Digivaste" (1975) and "Naaku Swatantram Vachindhi" (1976). The floodgates opened. Major film directors, such as Bapu, K. Vishwanath and K.Balachander, approached her with quality projects. She immediately became a huge star in Telugu films as diverse as the color-drenched, big-budget "Seeta Kalyanam" (1976) to the stark, naturalistic black-and-white film "Antuleeni Katha" (1976), where she won a special acting award for her unforgettable dramatic performance. But it was her dancing skills and nuanced acting style as a mute girl that made K. Vishwanath's "Siri Siri Muvva" (1976) into a timeless classic. It would also be her passport into Hindi films as K. Vishwanath remade it into "Sargam" (1979) and made her a overnight star in Bollywood as well. She earned her first Filmfare nomination as Best Actress for the film, and it would become one of her favorite films. She stalled on doing more Hindi films for two years as she wasn't fluent in the language. But she became fluent in Hindi, as well as Tamil, Kannada, Malayalam and Bengali, and had hit films in all these languages. She endeared audiences with her sincere portrayal of Amitabh Bachchan's girlfriend in her next favorite film "Sharabi" (1984), which became another big hit and earned her second Filmfare nomination as Best Actress. K. Vishwanath directed her to her third Filmfare nomination as Best Actress for her other favorite film "Sanjog" (1985). But some of her best performances would go unrewarded. 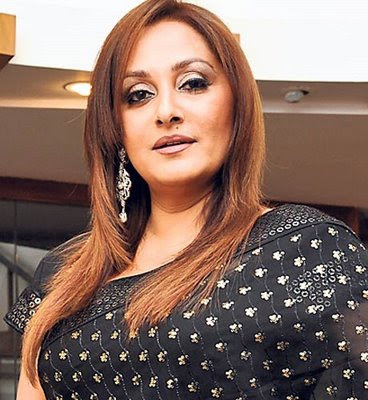 In the Telugu film directed by K.Balachander, "47 Rojulu" (1981) showed Jayaprada as a innocent girl duped by her husband in Paris, France, and her struggle to escape from him. But in Hindi films, she usually played the traditionally dressed, docile, obedient wife, and while that image led to hit films, it also eventually tired her audiences. She also seemed bored and indifferent with no new challenges ahead as she had already made her other favorite films: the Hindi films "Sur Sangam" (1985) and "Tohfa" (1984), the Telugu film "Sagara Sangamam" (1983), the Kannada films "Sanadi Appanna" (1977) and "Kavi Ratna Kalidasa" (1983). The only excitement came from her personal life when she met her husband film producer Srikant Nahata. They started out as friends as he was already a married man with children. But it turned into love when he stood by her because of her income tax problems. She was branded the "other woman," especially since Nahata wouldn't leave his wife. So she ended up marrying him in 1986, and he has continued to be married to both women. 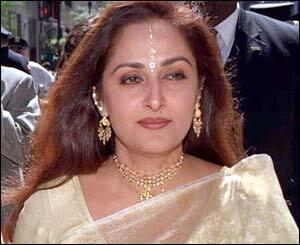 In 1994, she also became a politician by joining the Telugu Desam Party. A few years later, a rift developed with the political party and she was deeply hurt when she was no longer in the party. She also didn't have any major films lined up. But she kept up with her many social and humanitarian causes, especially related to poor women and children. She also became tough and strong and forged on ahead by joining a different political party in a different state, Uttar Pradesh. She won the election with the slogan line, "Andhra is my janambhoomi but Uttar Pradesh is my karmbhoomi." She also started making films playing stronger, mature roles. In "Deh," she played an older woman having an affair with a much younger man. She also wrote and directed "Class Medal," a Telugu film that starred her sister's son Siddharth and produced by her brother Rajababu. She didn't forget her first love, dancing, and did a dance ballet in 2005 that won her great acclaim. And she also dabbled in playback singing and even recorded an album with music composer Bappi Lahiri. In 2008, she received the Filmfare Lifetime Achievement Award for her long and plentiful contribution to the South Indian film industry. Having three careers (acting, dancing, politics), and a husband, left her no time to have children of her own, even though she has expressed a desire to have children. So far, she has shown no desire to give up her three careers and in fact, stated that she'll be as hardworking and dedicated in the future as she is now. By 2005, she has acted in nearly 300 films in a 30-year film career. She has acted in seven languages: Telugu (her mother tongue), Tamil, Malayalam, Kannada, Hindi, Bengali, and Marathi. She said that the only autograph she has ever taken in her life has been from her inspiration, Mother Teresa. When her days as a docile leading lady started winding down, she went into politics, but she hasn't given up films and plays stronger, mature roles. In 2005, she did a famous dance show in Mumbai, where she recreated the time and story of the fiery Amrapali through a ballet choreographed by Bhushan Lakandri with music and lyrics by Ravindra Jain. Part of the proceeds from this show were given to Deekshaa, the academy of classical dance and music. She was just fourteen years old when she was discovered dancing on stage and was cast as a dramatic heroine in her first Telugu film, Anthuleni Katha (1976). The famed director K. Balachander slapped her co-star Kamal Hassan right in front of her for muffing up a scene. Jaya got scared and ran away from the set crying. Her father soothed her feelings by taking her shopping for clothes and jewelry and convinced her to return to the set the next day. Celebrated Oscar winning filmmaker Satyajit Ray had called her "the most beautiful face on the Indian screen," a compliment that she cherished so much that she attended his tribute for the release of the book, "The Vision of Ray: Cine Posters & Beyond" (2005) with Sharmila Tagore and Jaya Bhaduri, the two stars that Ray discovered. Daughter-in-law of producer Sunderlal Nahata. I don't know why but it's been my destiny that I get along better with men than with women. In many ways I feel that my life is like my first film, Anthuleni Katha (1976). The character in the film is naive and trusting and has to go through a series of experiences to discover herself. My life has been like that too. Starting out as a small-town girl, I have come a full circle, doing things I never thought I could. Fate has been kind to me. I have no complaints. When you stop questioning and your loved one stops explaining, it means you've reached the perfect understanding. [On being married to a man who is already married to someone else] Love is not about power but about acceptance. I'm very sure that I cannot love anyone else but Shrikant Nahatafor the rest of my life. I've accepted him and I'm not going to change that just because our circumstances are complicated. . .his wife Chandra and I now share cordial relations. We've both accepted that we cannot live without Srikant, and if we have to live together, might as well do so amicably. As a young girl, I didn't always want to be an actress. But from the time I started off, I have loved it. In fact I always say that if I am reborn, I wish to be an actress again! My big break in Hindi films came in Sargam (1979) in which I portrayed the role of a mute dancer. The film was a remake of my Telugu film Siri Siri Muvva (1978). I observed mute students closely in preparation for the role. The film opposite Rishi Kapoor was a resounding success. On learning Hindi to help with her Bollywood career: I kept a tutor who rehearsed my lines. I was keen to do my own dubbing. I would get up at 5 am, take my Hindi class and then leave for my shoot. I would again work on my diction at night. [On her pairing up with star Amitabh Bachchan in Sharaabi (1984)] It was my first film opposite Amitji. I was very nervous on the sets. But he made me feel comfortable and corrected my lines. And the comfort level we shared was apparent on the screen. Amitji is a unique and sensitive artiste. Acting opposite him, one can learn a lot by carefully observing his skills. [On her reported rivalry with co-star Sridevi] There was no jealousy. All our films were done in a professional manner. [On her debut in Telugu films] My mother loved art and got me enrolled in music and dance classes. I began learning traditional Indian dance forms when I was only seven. My dancing skills were noticed at the school's annual function and I ended up bagging a three-minute role in the Telugu film Bhoomikosam (1974). I was paid Rs 10 for the role.